Grease a plate with a drop of ghee all over the plate and sides and keep it ready. Heat a non-stick kadai and add 1/2 tbsp of melted ghee.Roast the cashews till golden and set aside. In the remaining ghee,add the rava.As soon as u add the rava,it should sizzle.So ghee should be heated properly. Roast the rava in medium flame for 2-3 minutes till it gives a nice roasted smell.Remove in a plate. In the same hot kadai,add 2.5 cups of water . When the water starts to roll boil,simmer the flame completely and add the rava from the plate using one hand and stir it simultaneously using the other hand.Do it slowly.Lumps won’t form here as we are using more water. After u add all the rava,mixture will be watery.So mix it well till the rava absorbs most of the water and becomes slightly thick.Add a tsp of ghee to the rava mixture.It prevents rava sticking to the pan. Then cover the kadai with a lid and let it cook for 5 minutes. Keep the flame medium. Rava will be cooked well and if u take it with a ladle u should not see any white particles. Then add sugar and mix well.As soon as u add sugar,mixture will become watery. So keep mixing.It will splash. Be careful.Keep mixing for a minute till all the sugar is melted and gets mixed with rava.When it starts to leave the sides of pan,immediately add the remaining 2 tbsp of ghee,cardamom powder,roasted cashews and mix well. 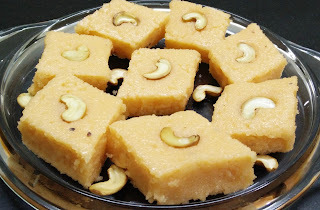 As soon as all the ghee is absorbed ,remove it immediately and pour it in the ghee greased plate.Do all these process quickly.Everything gets over in 2-3 minutes.The consistency of rava kesari will be like watery paste and it will fall like ribbon not like a ball.It will set once its completely cool.So don’t panic. To check the doneness of kesari,after pouring the mixture in the plate,touch it with your finger.If it is non-sticky,kesari is perfect.Else pour the mixture back to the kadai and mix it for a minute.Then remove. If u keep mixing for long time to leave the sides completely and roll like a ball,kesari will become hard and chewy. Let it set well for 10-15 minutes and it become warm.Now u can draw shapes if u want OR serve in scoops adding a tsp of ghee. Remove once its cool or warm enough to handle.